Over the past several weeks, a series of seven murals entitled In Exaltation of Flowers by painter and photographer Edward Steichen have been undergoing conservation treatment in the Barrel Vault Quadrant Galleries. The first step to any conservation treatment is the careful examination of the artwork. 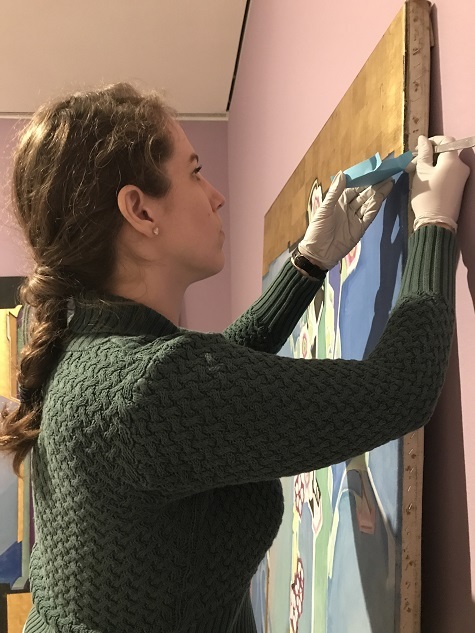 This gives a conservator insight into the condition of the artwork, and allows for a better understanding of the artist’s materials and working methods. A thorough examination provides invaluable information, which a conservator uses to plan the best conservation treatment. Fig. 1-2 Left: photographed under visible light Right: Photographed under UV. 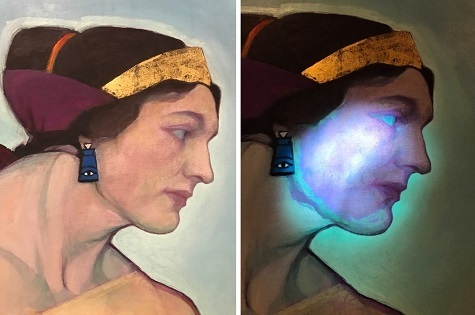 When viewed under UV, different pigments used to paint the sitters face become apparent based on their characteristic fluorescence. The conservation team has been examining and documenting the front and back of each mural. To better understand their painted surfaces, the team is using different types of surface imaging techniques incorporating the use of visible light, raking light, and ultraviolet (UV) radiation. The information gained from these different light sources provides a better understanding of the structure and condition of the murals. For example, viewing the murals under UV can give information regarding pigments, surface coatings, and previous restoration (fig. 1-2). Fig. 3 Conservation intern Diana Hartman positioning the XRF spectrometer on an area of metal leaf in preparation for analysis. The XRF spectrum above is an example of the data collected from this analytical technique. 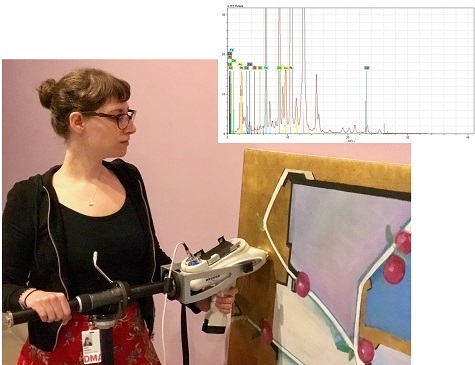 More in-depth elemental analysis using x-ray fluorescence spectroscopy (XRF) has also been carried out to help determine the types of pigments and metal leaf present on all seven murals (fig.3). This non-destructive technique uses an x-ray beam to excite electrons causing different atoms to emit energy characteristic of specific elements. 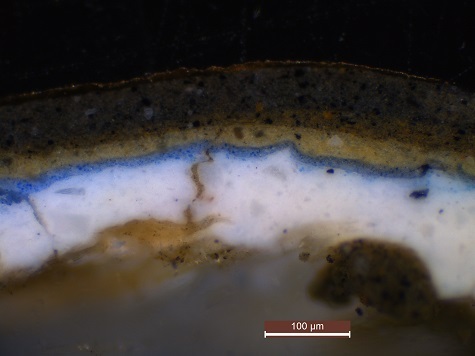 By detecting these elements, XRF provides information a conservator can use to identify the pigments present. Microscopic samples were taken to better understand the layered structure of the murals starting from the ground layer, priming layer(s), paint layer(s), and in some areas metal leaf (fig.5). These cross-section samples are viewed at high magnification with both visible light and UV, which allows for a close look at the type of pigments, adhesives, and coatings present and the order in which the artist applied them. Fig. 5 Cross-section sample magnified 200X, photographed with visible light. Description of the layers from the bottom up: canvas glue sizing, white ground, blue paint, light yellow paint, dark yellow paint, black paint, adhesive, gold leaf.